Sometimes the most distinctive designs are those that reflect the simplicity of forms passed down from generation to generation. 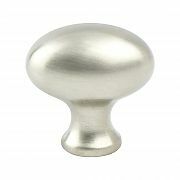 The Euro Classica collection features this knob in an understated tone. And because simplicity is always in vogue, this new collection will add a beautiful highlight to a wide range of cabinet designs in traditonal and contemporary styles. Note: This product is also known as 70901BPNC, BQ70901BPNC on other websites.